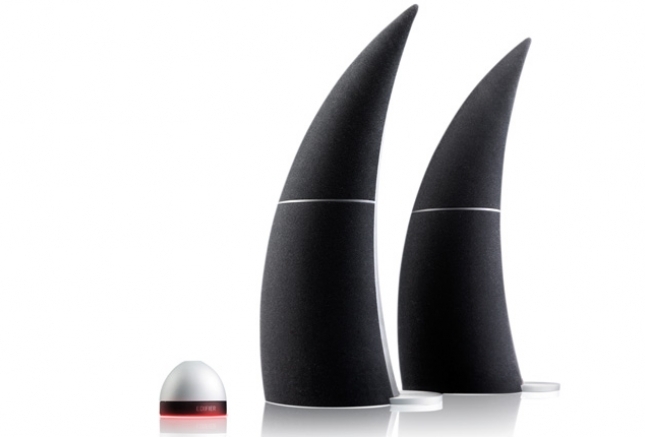 Dubbed the Spinnaker from the design of these 2 speakers, spoiler alert, they were built to resemble sails. 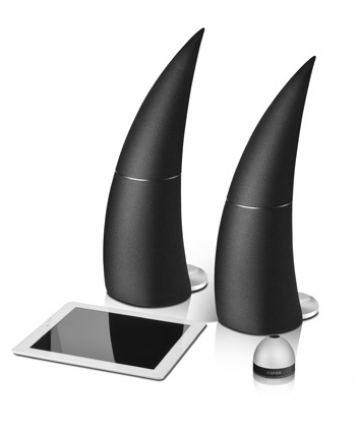 This 2.0 speaker system comes from a long list of award winning speakers and these 15 inch tall speakers have a shape designed to enhance the audio experience. Each speaker contains 19mm silk domed tweeter, 2 ¾ inch mid range driver, and a 4 inch downfiring subwoofer. This device is also Bluetooth enabled and supports audio connectivity and control via wireless dome shaped multi functional remote. On top of all that, there is an optical input as well for use as a home stereo or secondary entertainment system. Now that these babies are plugged in and cranked up, lets see how they do. I did not know what to expect as this was my first item to review from Edifier, and after the Spinnaker’s hands on time, I was in love. I am at my desk a lot, and while I currently use the Supertooth Disco as my speaker for the office, they are always being used for games or music. I have a backlog of items to review, so I hooked the rhino horn looking speakers up and locked myself in the office for two days with my Spotify playlist. These speakers are by far the best sounding speakers I have yet to review, the highs are bright and clear, the mids are full, and the bass was deep but does not overpower the mids and highs. I was skeptical about the lack of dedicated subwoofer and there is an input should you want to add one, but after 3 straight days of listening to a variety of music, there really isn’t a need for a dedicated subwoofer unless you must feel what you are listening to. There are only a couple things that stand out negatively when I think of the Spinnaker as a whole. The first being the overall look, I understand that they are meant to look like sails, and I actually knew what a Spinnaker was before receiving the product but they look an awful lot like a horn, even if you know they are meant to look like sails, you cant un-see the rhino tusks coming from each side of my monitor. My only other issues is with the remote,it is a bit complicated and takes some getting used to, and this is why I am glad the set of speakers came with two credit card sized cheat sheets for the remote. While the multi functional remote is nice, especially with it being rechargeable, but the button on the top didn’t always seem like it would pick up what I was laying down, so I would have to really press on it in order to know it registered my input. Lastly and this is a personal preference, but the coating or metal used on the remote is like nails on a chalkboard to touch. All in all, I loved this 2.0 speaker system. I did not know what to expect from Edifier and I am glad they sent the Spinnakers because they are truly a great pair of speakers. 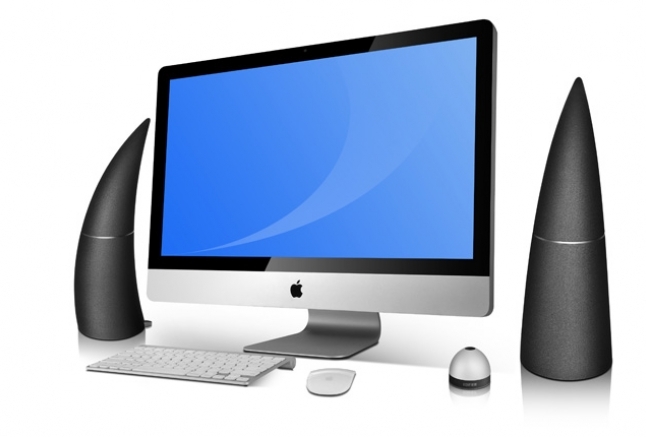 Whether you are using them for your computer, playing games, doing work, or in your living room as a home stereo, these horn sail shaped speakers can fill a room with clear sound that will get noticed by anyone in the room. Though I may not be a fan of the look of the speakers, I will admit they are unique and very eye catching. Most people that have come across my desk immediately ask about my African safari…rhino joke, but regardless to whether the look is liked or not, the sound that these bad boys put out will quickly make you think the modern poacher look is hot right now.